The gun itself is a double barreled .380 caliber pistol made from plastic, though it does have a metal core. It is exceptionally light in weight, and the entire frame is one piece only. 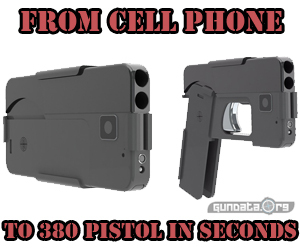 When it is folded up to look like a phone, it is in a safe position. To be able to take a shot, you will need to remove the safety with a single click which will open it up, leaving you ready to fire. Although this product is revolutionary and will help thousands feel safer owning and carrying a weapon, there are those that believe it will be a threat to security, especially in public places such as airports. The creator explains that its internal elements are the same as any other gun, and these will be picked up while being scanned through a metal detector. This gun will be available for $395 starting from the beginning of October 2016. To date, there are more than 4000 people globally who have shown their interest in purchasing this revolutionary gun. Let's just make that number 4001 after writing this article.